This book is the eighteenth in the 21 Brotherhood of Light Course series by C. C. Zain on the Hermetic Sciences, Astrology, Alchemy, Tarot, Kabbalah and the Occult. This book covers the effect of unseen (occult) forces that arise from various sources including astrological energies, misinformation in public media, the thoughts and actions of others, rituals, religious beliefs and ceremonial magic. 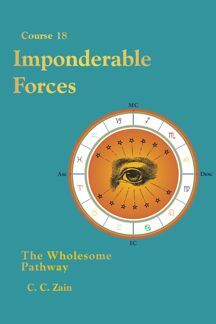 With respect to astrological forces, the author explains how transits, minor progressed aspects, major (secondary) progressed aspects and other astrological weather conditions have the power to impact us and what to do about it. The book discusses in detail how to work with birthstones, numbers, names and environmental vibrations. It also shows how to avoid being influenced by black magic, suggestion and inversive propaganda. Course 18 of 21 in the Brotherhood of Light Study Program.